Celabramos la Fiesta! – Therefore, let us keep the Feast! What started out as a traditional mission trip soon became a new opportunity to bring cultures together and experience a new type of mission trip. This spring, we planned for youth from St. Francis Episcopal Church in Macon, Georgia to come visit El Camino Real and the central coast. The Rev. Ben Wells of St. Francis and the Rev. Deacon Arthur Villarreal of St. James wanted the youth to experience a different kind of mission trip. The Revs. Wells and Villarreal had years of experience with youth ministry and more traditional youth mission programs, but this year called for something different. The youth started by arriving in Berkeley and staying in the affluent Berkeley Hills next to St. Clements, a 1928 Prayer book church in Berkeley in the Diocese of California. After a couple days of worship and touring in the San Francisco Bay Area, the youth would be exposed to central coastal California. The Rev. 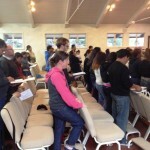 Wells came first and served at the 9:30 service in Watsonville, then, all the youth from Macon arrived in Seaside at San Pablo, Apostol in the early afternoon. 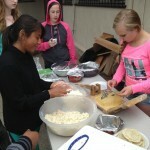 In Seaside, the youth were joined by the youth from both Watsonville and Seaside as all joined together to help make food for a youth fundraiser. In addition to making food, the youth enjoyed getting to know each other better, through playing games and having a joint youth group session. After the joint youth group session, the youth sat together in small breakout groups and worshiped at the 7:00pm Spanish language service. After the service, the youth promoted the food sales for the youth group and then were off to All Saints, Carmel. On Monday, the youth had morning prayer in Carmel, followed by a tour of the aquarium. After the tour, the youth headed down to Trinity Gonzales, a prayer station and emerging type church set in the agricultural setting of Gonzales. 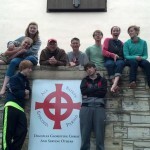 The youth engaged in more tradition mission work with work in and around the actual church grounds. From there, the youth headed back to Seaside where they were joined by their friends from Seaside and Watsonville as they headed to a beach in Monterey for a Eucharist, bonfire and more fellowship. After that, they headed back to Carmel for another night at All Saints. Tuesday, the youth headed up to Watsonville to drive through the fields. The youth met at All Saints/ Cristo Rey and then were off for a tour of the fields and ranch, to see the lifestyle. From there, the youth headed back up to Berkeley where on Wednesday, they would again have a more traditional mission experience by volunteering with a food pantry, in Oakland. St. James in Oakland is a parish that is moving forward with a blended English/Spanish service. The planning of the trip was in line with the purpose, to let God’s mission be revealed. Rather than having a strictly traditional mission-styled experience, the focus was on letting the mission reveal itself in the planning. Having partners that were willing to allow for this space was critical to allowing it to come to life. 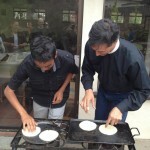 Having traditional and non-traditional elements were important to allow the youth not only to see mission as works of charity, but to allow them an experience both living and worshiping with youth from a different context. Additionally, seeing similarities as well as differences and expressing those was also a goal. 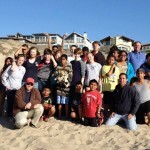 Youth from Macon, Seaside, and Watsonville at Eucharist on the beach in Monterey with Bishop Mary. Part of the gang, St. Francis – Macon, San Pablo – Seaside, and Cristo Rey/All Saints’ – Watsonville, at the beach in Monterey. Youth at All Saints’, Carmel, their home on the Peninsula. Break time at Trinity, Gonzales. Evelyn of San Pablo teaching youth from Georgia how to make tortillas. Nick from San Pablo teaching the Rev. Deacon Villarreal about tortillas. Christian in the fields in Watsonville. 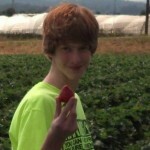 Fresh strawberries! Youth from St. Francis – Macon worship with San Pablo, Apostol, Seaside. Through the experiences the youth had, they were able to experience the different marks of mission, all along the King’s Highway. The process of reflection is now taking place, where the youth are being lead through a process of discernment and discovery about what the experience has meant to them. Two initial observations that were made came one from each side. When the youth from Georgia were reflecting on their time in Seaside and worship experience, they noted the discomfort with the differences, the language and style being different then they were used to experiencing. Yet as they dug a little deeper, the positive connections came out…”they really get community,” was the consensus.